The fourth season of open enrollment in the Affordable Care Act's exchanges begins Tuesday. A brokerage in Philadelphia's Chinatown helps people find coverage with or without subsidies. 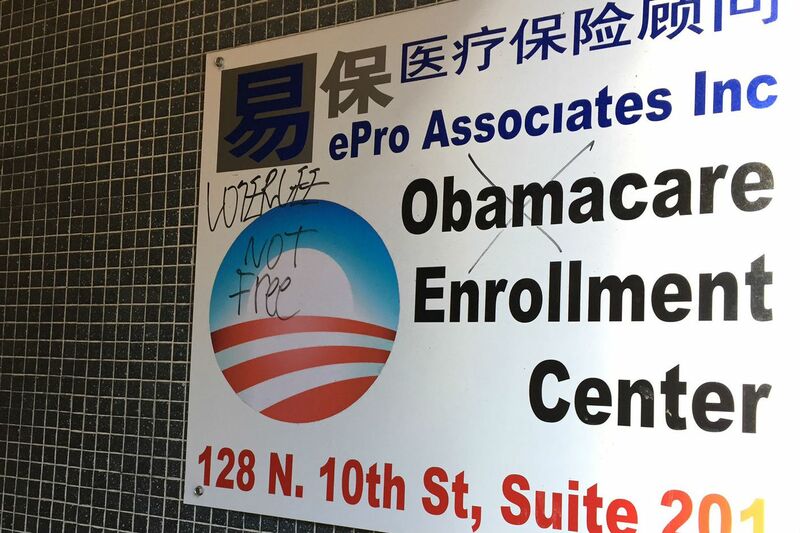 From his insurance office in Philadelphia's Chinatown, Derrick Zhang has a close-up view of the good and the bad about Obamacare insurance, which is starting its fourth annual open enrollment period on Tuesday. The good: The five employees of his ePro Associates Inc. all can get coverage, regardless of preexisting conditions, with income-based subsidies that reduce their premiums to around $100 a month, which their boss reimburses. Before the Affordable Care Act (the formal name for Obamacare), Zhang couldn't buy group insurance once one person got sick and the cost for all skyrocketed. The bad: Obamacare patrons like Zhang himself, who earns too much to receive a subsidy, will lay out more cash for coverage next year as premiums rise. And they will have fewer plans to pick from, as insurers have been leaving the government marketplace, saying they can't make money. Just one insurer remains in the program in Southeastern Pennsylvania, Independence Blue Cross. "To be honest, there really aren't a lot of options," Zhang said. In Southeastern Pennsylvania, the average Obamacare premium for a 50-year-old nonsmoker buying the most common benchmark plan is rising more than 50 percent, according to an analysis by Avalere Health. But in New Jersey, where coverage was much more expensive in past years, that average plan's cost is rising just 5 percent. Unsubsidized premiums there will cost $111 a month less than across the river. As prices go up, more people are eligible for subsidies, so it's worth checking online at Healthcare.gov even if you think you are ineligible. "It is really important for people to go back and check the numbers, that they shop and get the tax credit," said Antoinette Kraus, director of the Pennsylvania Health Access Network, which helps consumers buy coverage. Federal estimates indicate a lot of people may be leaving money on the table — 111,000 residents of Pennsylvania and 44,000 in New Jersey who would be eligible for tax credits that subsidize monthly premiums for insurance purchased on the exchange have been paying full price for insurance off the exchange. Zhang says he plans to remain insured, but the rising premiums won't do anything to solve what may be Obamacare's biggest problem: enrolling enough young and healthy people to offset costs for covering older, sicker individuals. There is a tax penalty for those who can afford insurance but don't buy it, but critics say the penalty is low enough that some would rather pay it. And as coverage gets costlier, more people will be exempt from this "individual mandate," said Cynthia Cox, associate director of health reform and private insurance for the Kaiser Family Foundation. "They won't be penalized, but if they end up having a health condition or an accident and need to go to a hospital, they could be on the hook for big medical bills," Cox said. The mandate to have health insurance exempts households that would have to pay more than 8 percent of their income for coverage. Most others who decide to go without insurance face a penalty from the IRS equal to 2.5 percent of total household adjusted gross income, or $695 per adult and $347.50 per child, whichever is greater. The deadline for buying coverage that will start in the new year is Dec. 15, with open enrollment continuing through Jan. 31. After that, only consumers with major life changes, such as a job loss or marriage, can buy plans on the individual market until the following year. The website Healthcare.gov, where you can apply for coverage, has added a feature that matches consumers whose carriers are dropping out of the exchange with the closest comparable plan for the coming year. A combination of the rate increases and the departure of some insurance companies also means that some consumers, particularly those at the higher end of income eligibility, might find better deals with unsubsidized plans off the exchange. "If you can get something that's 50 or 60 bucks a month less, check it out," said Ron Ruman, spokesman for the Pennsylvania Department of Insurance. He added that consumers should shop carefully, since policies sold off the exchange are not listed on the federal website, which offers apples-to-apples comparisons. The insurance department websites in Pennsylvania and New Jersey list every plan available. Many brokers offer plans both on and off the exchange, but subsidies are available only for purchases on Healthcare.gov. The insurance company departures leave nearly one-third of Pennsylvania's counties – including all five in the southeast – with a single carrier, down from three this year. The state insurance department approved rate increases averaging 28 percent for Keystone Health Plan East and QCC Insurance Co., both subsidiaries of Independence Blue Cross. They will offer 12 plans on the exchange. Since some of the insurers that left had lower-cost plans, the average premium price paid by a nonsmoking 50-year-old for the benchmark second-lowest-cost silver plan is increasing 51 percent before subsidies, from $386 a month to $584, according to the analysis of counties nationwide by Avalere and the Associated Press. Every county in New Jersey will be served by two insurers on the exchange, AmeriHealth of New Jersey and Horizon Blue Cross Blue Shield of New Jersey, down from three or four this year; they are offering 24 plans on the exchange. The state approved a range of price changes for the individual market, some of them declines. The Avalere/AP analysis showed the benchmark example up 5 percent, from $453 to $473 a month. Carriers in New Jersey “priced correctly at the outset and generally have had pretty good financial performance and have not had to make big adjustments,” said Katherine Hempstead, who directs the Robert Wood Johnson Foundation’s work on insurance coverage. Insurers in Pennsylvania "really underpriced the products initially," she said. "Now this year they are adjusting and they need to, which is why prices are rising more."